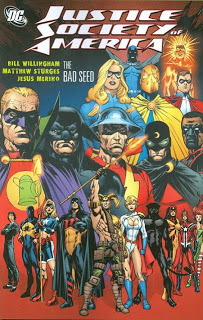 Justice Society of America: The Bad Seed Collected Volume Review. After finishing the story Constallations in JSA All Stars, I decided I would like to go back and read some of the early stories from before the JSA split into two teams. I decided to settle on The Bad Seed because, I think, it details why the team splits and the reason why is quite interesting and is explained in this book. Where The Bad Seed works particularly well is the conspiratorial attack within the team themselves with the team being targeted by their villians a lot earlier than they imagine within these pages and the motives as to why these villains are attacking them kept me guessing throughout the story. There are moments when certain members of the team feel quite scared, Power Girl, Jay Garrick's Flash and Jesse Quick often feel quite panicked and this seems like a great shift for a team that starts the book almost far too overconfident with their abilities and it is good to see that, as the book goes on, each one the characters realises that they are not as confident as they think they are. It is a refreshing take on teams who have been together so long, they almost become laid back in their approach. Authors Bill Willingham and Matthew Sturges show the fractures in the team through a number of slight and subtle ways throughout the book but most notably the continual disagreements between Magog and Wildcat. At this point Magog is a relatively new member of the team and his views tend to be militaristic and Wildcat is tough, often quite gruff and a former heavyweight member of the team and the pair are more alike than they would care to admit. What struck me with Magog is that he almost seems to be a nineties caricature of a superhero and the pair are enough to convincingly show the readers that the team is turning on each other. The pair of writers have also managed to consistently remember that Power Girl is the chairman of the team and I was pleasantly surprised by this as most of the time, particularly when their are two writers, one or the other of them forgets seemingly unimportant facts like this but it is picked up on by the readers of the comic book and sometimes spoils their enjoyment. So praise has to be given to the authors on that point. Where the book perhaps falls short is the villains themselves. Early on in the story, the team fights a group of random villains from the pointless Tapeworm to the obviously powerful Eclipso who comes across as just as stupid as Tapeworm. Another disappointment is that the readers will automatically know who the traitor is if they have read any of the other stories written by Willingham, in particular Shadowpact. And surely I couldn't have been the only one to notice the similarities between this story and Avengers: Disassembled? But all in all, I enjoyed The Bad Seed. It has a big enough scope to keep fans invested and leads nicely into the next books for the now split team, JSA: The Axis of Evil and JSA All Stars Constellations. The artist for this book is Jesus Merino and his art remains consistant throughout though I did notice that towards the end of the story there are some quite heavy ink moments which stand out because they look different to the rest of the book. But that is a minor quibble as this a good story which neatly sets up the future for both the JSA teams! JUSTICE SOCIETY OF AMERICA: THE BAD SEED, WRITTEN BY BILL WILLINGHAM AND MATTHEW STURGES WITH ART FROM JESUS MERINO WAS RELEASED IN A COLLECTED VOLUME IN 2010.